Schizophrenia doesnt just afflict our loved ones; it slowly replaces them with a stranger we no longer know or understand. Its a harrowing, bewildering condition . . . and the church can seem ill-equipped to minister to those with mental illness and their families. Simonetta Carr acutely understands, and she offers her own experience in this story about a mothers fierce love for her son. Holding nothing back, she chronicles the journey of her evolving role as the mother of a son with schizophrenia, as well as the guilt, hope, and fervent prayer that went along with it. She then moves beyond her own experience to bring help to others dealing with this illness, providing information and wisdom culled from psychiatrists, pastors, and sufferers of schizophrenia. Whether you are suffering yourself, have an afflicted loved one, or are caring for brothers and sisters in crises, Simonettas hard-won insights will uncover joy and the gospel in the midst of your situation and teach you to be an advocate for those who cant fight for themselves. Simonetta Carr, mother of eight and homeschool educator for twenty years, has worked as a freelance journalist and a translator of Christian works into Italian. She is the author of the series Christian Biographies for Young Readers. 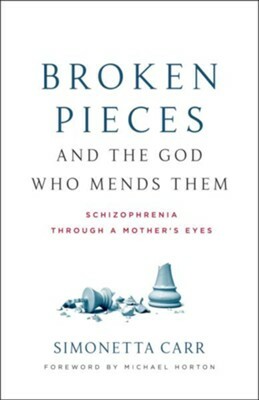 In Broken Pieces and the God Who Mends Them Simonetta Carr describes a painful journey that no parent ever wishes or expects to travel - the two years from her son Jonathan's diagnosis of schizophrenia to his death. She tells the story with vulnerability, expressing the pain that she, her husband, son Jonathan and their other children experienced, as well as the fear, frustration, helplessness, lament, and desperate seeking after God. By beginning each chapter with an entry from Jonathan's journal, she invites Jonathan to speak into the story as well. Raw and emotional, many parents on unexpected and unwanted journeys with their own child's mental illnesses will find a fellow traveler who tells her story and provides wisdom and even hope that God is faithful in the darkest circumstances. In Broken Pieces, Simonetta vulnerably lays open her heart and shares a story of love and loss, of suffering and redemption. Simonetta masterfully explores the brokenness of the mental health care system, the imperfections of our churches, the confusion of those who live in the grip of mental illness and the shattered hearts of those who love them. Yet in the midst of the pain and brokenness, Simonetta keeps drawing us back to the God who mendsthe God of grace. Broken Pieces is a definite must-read for those who love someone living with a serious mental illness. I'm the author/artist and I want to review Broken Pieces and the God Who Mends Them: Lessons Learned on Mental Illness.